In Voorhees, New Jersey, just a short drive from Philadelphia, sits a grand home unmatched in many ways. Built in 1990, the 16,500-square foot custom "Alton Manor" is an executive estate boasting resort quality recreation facilities. After a recent renovation, a new DaVinci Roofscapes Bellaforté Slate polymer roof tops this massive complex which features six bedrooms, an in-law suite and a three-story pool house connected through a tunnel to a dedicated Man Cave. A 5,000-square foot entertainment area includes a 42-stool bar, dance floor, professional DJ equipment, gaming area and a 12-seat movie theatre. "This French Manor Estate is located in a secluded wooded setting in Camden County," says Gerard Ferro, founder and CEO, Free For All Incorporated. "We've completed the renovations and have it available for sale. "Top-quality products like imported Italian marble and ceramic flooring were used in this house. When it came time to decide on a roof, we wanted the best possible product to replicate real slate, so we chose DaVinci's synthetic slate roofing tiles." The roof on the expansive estate is highlighted by copper window coverings and snowguards. "The entire complex has a unified look because of the roof," says Ferro. "The realistic look of the DaVinci products complement the high-end design of this property which includes three large Koi ponds, four waterfalls, two bridges, an elevated sundeck and a custom pool. "This is a top-of-the-line estate that was built using only the best products available to create an opulent living experience. The DaVinci Slate roof is the ideal complement to this impressive property." 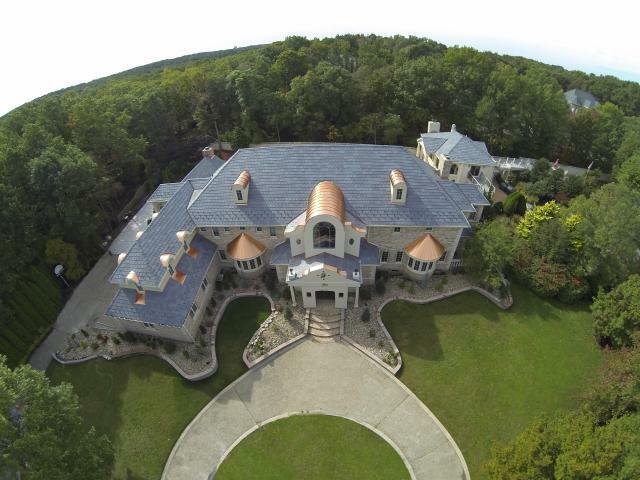 Visit A New Roof Overhead for another story of a successful New Jersey DaVinci reroofing project!